Rakbar Khan alias Akbar, who was lynched by a mob in Rajasthan’s Alwar on Friday, died of “shock as a result of ante-mortem (before death) injuries sustained over body”, the post-mortem report has stated. 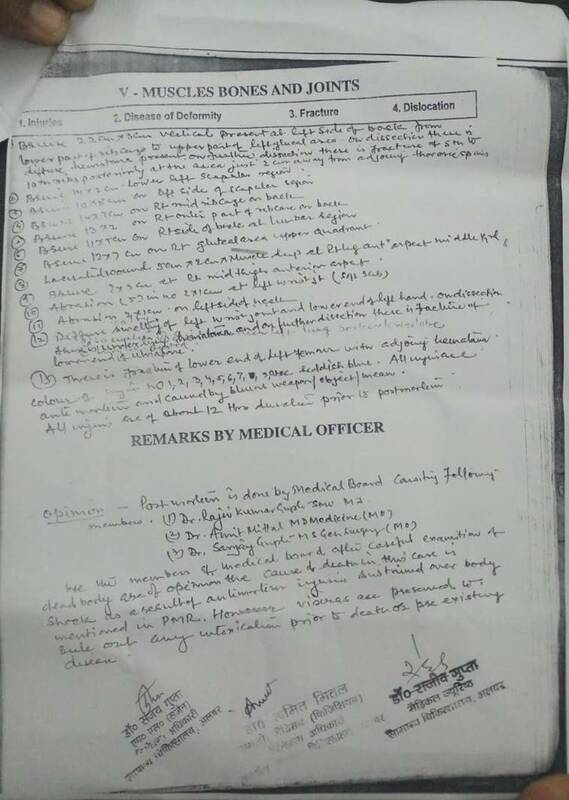 The autopsy report further added that Rakbar suffered 13 injuries –eight bruises, two abrasions, a laceration, and a fracture in wrist and another in left femur– due to the attack. “We the members of the medical board after careful examination of a dead body are of opinion that the cause of death, in this case, is shock as a result of antemortem injuries sustained over body mentioned in PMR. However, visceras (sic) are preserved to rule out any intoxication prior to death or pre-existing disease,” the doctors added in the observation. Akbar and his friend were reportedly stopped by villagers, suspecting the duo to be cow smugglers. “While Aslam (his associate) managed to escape, unknown locals beat him (Akbar) up with sticks which led to serious injuries on his arms, legs and all over his body. He then collapsed and we took him in our police jeep to Ramgarh CHC where doctors declared him dead,” the FIR states. In his statement to the police, Aslam added that the men who attacked them claimed the support of an “MLA” and that they “could not be harmed”. His statement comes at a time when the state police are under fire for causing a delay in taking Akbar to hospital. According to the eyewitnesses, The Indian Express spoke to, the police took over two and a half hours to get Akbar to a hospital barely 4 km away from the lynching spot. The police arranged for vehicles to take the seized cows to a shelter, washed Akbar and even stopped for tea before getting him to the hospital, where he was declared brought dead. Special Director General N R K Reddy said that there was an “error in judgement” by the policemen. State DGP O P Galhotra also ordered a probe by a high-level team under Reddy to look into “connected issues related with the murder of Akbar”. According to Reddy, Akbar appeared fine to police and they did not realise he had critical internal injuries. “The officials visited the spot, spoke to Akbar’s family, eyewitnesses and concerned police officials. Based on the team’s preliminary findings, ASI Mohan Singh was suspended and three policemen – Vijay Singh, Surendra Singh and driver Harendra Singh – who were with Mohan on Friday night, were sent to police lines,” he said.